Corned beef. Processed and canned. Does not contain anything other than beef, salt and sugar. Corned beef usually differs from "canned meat" by a higher required level of quality. In the specification, the stability test will indicate if the preservation has been performed properly and if the tin is not overfilled. Overfilled tins may burst with heat during storage or transport. The pressure in a preserved tin is normally nil or negative. A pressure increase is a sign of microbiological growth or an overfilled tin. Specifications vary with national regulations. Here below, we give our most commonly used specifications. Refer to HQ when offered specifications which are different from our standard specifications. It will need to be approved by a food specialist. Importation of food is always subject to acceptance from the national authorities, based on their national specifications; check these before purchasing. Impact on the local, national, or regional market availability and prices should be carefully looked at before purchasing large quantities. For all aspects of the product, unless described otherwise here below, the standard of Codex Alimentarius last edition applies, including the packaging. Product must be fit for human consumption and be of sound, fair and marketable quality. For laboratory test, provide a minimum of 5 tins per batch. Maximum 50 milligram/kg content expressed as sodium nitrate. No pressure increase, no pH difference more than 0.5, no microbiological growth after 7 days under ISO7218. - Shelf live minimum 3 years from manufacture date. - Production date less than 1 year at date of delivery. - "Use by date" 5 years from date of manufacture and a minimum of 3 years after the date of delivery. - Analysis of contaminants must state that the corned beef is "fit for human consumption". 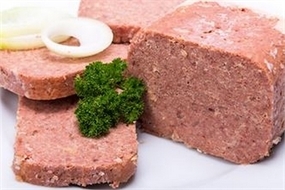 - The corned beef must not contain bones, ligaments, gristle, hair, any foreign substances or additives, particularly fattening agents, other than tendon collagen of bovine origin. - The corned beef must not be finely minced and must be free from unpleasant odours and tastes. - One batch can be a maximum of 24h in continuous production. The meat must be processed from animals in good health, under excellent sanitary conditions and which are supervised by qualified technical personnel. The area of production must, in the 12 months preceding manufacture, have been free from foot-and-mouth disease, bovine spongiform encephalopathy (BSE) and any other infectious disease which is compulsorily notifiable. On delivery, the supplier shall provide the purchaser or his representative with a veterinary and/or health certificate from an official entity confirming that these requirements are met. Food grade can of net weight of 200g or 500g hermetically sealed, showing no sign of corrosion at the welded joints or inside, and no deformation. Can to offer easy opening system, or to be delivered with folded can opener. In export carton boxes of double corrugation of 10kg net. Cartons to resist without any damage 6m high stacking for 6 months without deterioration, and a minimum of 10 manual handlings. The sealing of the outer box is with glue or 50mm tape or strapping; capable of resisting a tropical climate (humidity and sunshine) for six months. Tape overlaps of 10cm minimum. As per Codex STAN 1. Each carton box, same as above plus number of pieces par box. Minimum documentation required for quality assurance from the supplier. Other documentation needs to be provided according to the purchase agreement.